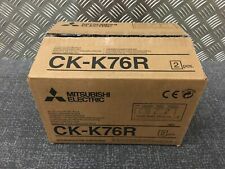 Mitsubishi Electric CK-K76R 15X20 Paper, 160 Prints, Brand New Open Box. COMPLETE CD KIT INCLUDES WIRING CD CHANGER AND HEAD UNIT. Mitsubishi 10 Disc CD Changer MZ312569. Upgrade your standard radio so you can play CDs. Its from a Shogun and has all the wiring with it to just plug it in. Will just plug in to the standard radio/cassette unit and has the convertor plug included in the sale. When locating the CD changer in your boot just need to fix the black ground wire to an existing ground bolt. Have powered up and changer working. Any questions just message. Happy for you to collect if easier approximately 5 miles from Bakewell near Calver/Baslow. Thank you for looking. EcoChoice Parts do not cover any parts that show signs of being tampered with (i.e. being opened and do not cover labour costs). EcoChoice Parts are Green Parts also known as "recycled parts" or "used parts" and are manufacturer parts that have been carefully removed from a vehicle during the dismantling and recycling process. 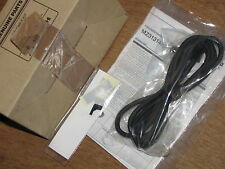 Part number MZ313148 / KIT-7070CE. Be aware that there may be variations of a part due to your car being an import or by part superceeding etc. MITSUBISHI L200 DID. REMOVED FROM A 2007 L200. 10 DISC CD CHANGER. What you see is what you will get ! Item is in used condition may have usage marks and scratches. GROM Audio Accessories. GROM Audio. We are the UK distributor for GROM Audio. Mitsubishi Shogun 1998-2005. Mitsubishi (older) - USB iPhone Android integration kit. Android Integration. iPod®/iPhone® Integration. Part Number: MZ312569. We willALWAYS resolve your issue but would ask that you call us in order to do so. We are a bonefide 'End Of Life' Vehicle Dismantlers situated in East Devon. We will do our upmost to ensure this is the case on each and every occasion. CD changer for a Mitsubishi l200 animal K74. The CD changer and cable to link it to the radio were both removed from a Mitsubishi l200 K74 that has been sat parked up. OUTLANDER 2013 -2018 Mk3. Make / Model:MITSUBISHI OUTLANDER. VEHICLE SHOULD BE DRIVEN 20 to 30 MILES THEN THE OIL/FILTER REPLACED AGAIN. We would also like to assure you that this is the only engine we have experienced these failure rates with. From a 2006 pick up. Cd MULTICHANGER. It was taken from a Mitsubishi Shogun Elegance 2004. In working order. Genuine Used Mitsubishi 10 Disc CD Changer. All marks have been captured to the best of ability. From a year 1996 Mitsubishi Delica L400 2.8 Turbo Diesel. Automatic Gearbox. Nous pouvons vous aider si nécessaire. Let op: voor internationale verzending kan de aangegeven prijs niet juist zijn. Dit komt omdat we prijzen voor lange afstanden van het Verenigd Koninkrijk geven. BREAKING: Pajero Shogun L200 Delica Shogun Sport Shogun Pinin. AND ALL OFFSHORE ISLANDS ( NORTHERN IRELAND, ISLE OF MANN/ WIGHT ETC ). PH19-PH26, PH30-PH44, PH49-PH50. PA20-PA49, PA60-PA78. IV1-IV39, IV40-56, IV63. Mitsubishi (recent) & Peugeot / Citroen - USB3 iPhone Android integration kit. Citroen C-Crosser 2007-2012(no NAV). Citroen Aircross 2012-2014(no NAV). Peugeot 4007 2007-2012(no NAV). Peugeot 4008 2012-2014(no NAV). GROM Audio Accessories. GROM Audio. We are the UK distributor for GROM Audio. Mitsubishi ASX 2011-2014(no NAV). Mitsubishi (recent) & Peugeot / Citroen - USB3 iPhone Android integration kit. Mitsubishi Outlander 2008-2013(no NAV). Please be aware this part is used, previously fitted second hand item. There may be some cosmetic scratches and or marks. Please view all images. All parts are supplied with a 30 Day Guarantee (Please view our Terms of Sale) The information below shows details of the donor vehicle. This is to be used as a guide only. Any mileage information shown is not guaranteed. Donor Vehicle: MITSUBISHI L200 K74 WARRIOR 2.5 TD MANUAL. ANY LOCATION OUTSIDE THE UK. Arran - KA27 KA25. Oban - PH 33, PA20-49, PA60-80, KA28. Inverness - ALL. Shetland ZE1-3. Orkney KW15-17. 4X4 PARTS 4 YOU. PART NUMBER -MZ312569. CAR TYPE - MITSUBISHI L200. USED -CD CHANGER SYSTEM. Mitsubishi Colt MK6 CZC Z36A car cd changer / player 1.5 i 1499 cc 4A91 5 Speed Manual Z36A BNMHR6 01/05/2006 to 01/07/2009 Petrol 16 Valve Mark6 CZC 2 Door Convertible v189-19363. UK: AB31, AB33 -> AB38, AB44 -> AB45, AB51 -> AB56, FK18 -> FK21, G84, HS1 -> HS9, IV1 -> IV36, IV40, IV52 -> IV54, IV63, KA27 KA28, KW1 ->KW14, KW15 -> KW17, PA20 -> PA40, PA41 -> PA49, PA60 ->: PA78, PH19 -> PH41, PH42, PH43 -> PH50, TR21 -> TR25, ZE1 -> ZE3, Isle of Wight, Northern Ireland and all Isles off mainland UK. CD Changer Mitsubishi PAJERO III (V60) (4.00-12.06). We suggest you have a trained technician perform the repairs. Also all part and id numbers will have to match with your vehicles computer unit in order to work. The item may have minor scratches, tears, dents, scuffed, signs of corrosion or similar attributes of used car part, Which can be seen in the photos, it is used part. Part number:MZ312569. 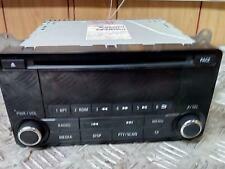 Mitsubishi L200 Shogun Pajero CD Changer. MITSUBISHI PAJERO PININ SHOGUN 1.8 GDI. - Modell/Typ PAJERO PININ SHOGUN 1.8 GDI. CD changer. All may lead to looking at the pictures, complete vehicles, are probably already broken down. For this reason they are known also with the word ' used ' - so have you ever used. Artykuły z łamane lub nie istniejących plomb, etykiet lub pieczęcie jako nieważne w stanie dostawy. Código del motor Color interior (código Trim) F15C verde malaquita. Color exterior (n.º de laca). MITSUBISHI PAJERO III LONG (V75W) 3.5 GDI 4 X. - Modell/Typ PAJERO III LONG (V75W) 3.5 GDI 4X. CD changer. This is in relation to the used body parts as normal. Aggregates are generally sold without mounting parts. Artykuły z łamane lub nie istniejących plomb, etykiet lub pieczęcie jako nieważne w stanie dostawy. Código del motor cool-plata se reunió. Color exterior (n.º de laca) Azerbaijan Da 33.88GBP. Denominación del vehículo. (MZ312569). Compact 6 Disc Changer. WE ARE A FAMILY RUN MITSUBISHI MAIN DEALER BASED IN NORTHWEST. AND ABLE TO DISTRIBUTE NATIONWIDE. ISLE OF MAN. We will always help you to have a 100% positive happy buying experience. MITSUBISHI Pajero/Shogun 2005 Disc CD Changer MZ312569 . Condition is Used. Dispatched with Other 48h Courier. Mitsubishi Electric CK-K76R, 1 X Roll Ink-film Set, New Open Box. 1 Pcs. GROM Audio Accessories. GROM Audio. We are the UK distributor for GROM Audio. Mitsubishi Shogun 1998-2005. Mitsubishi Galant 1998-2009. Mitsubishi (older) - USB iPhone Android integration kit. Android Integration. GROM Audio Accessories. GROM Audio. We are the UK distributor for GROM Audio. Mitsubishi Outlander 2003-2006. Mitsubishi Galant 1998-2009. Mitsubishi Lancer 2002-2007. Mitsubishi (older) - USB iPhone Android integration kit. GROM Audio Accessories. GROM Audio. We are the UK distributor for GROM Audio. Mitsubishi (recent) & Peugeot / Citroen - USB3 iPhone Android integration kit. Citroen C-Crosser 2007-2012(no NAV). Citroen Aircross 2012-2014(no NAV).